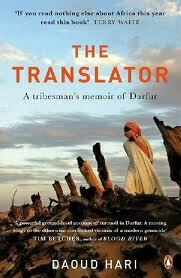 The Translator is Daoud Hari’s, a Darfur tribesman's, memoir about the Darfur conflict, and it’s a must read. Daoud Hari worked as a translator for NGOs and journalists in refugee camps in Chad, and as a guide for journalists who wanted to tell the world about the Darfur conflict. In 2006, Hari was captured and tortured for months by the Sudanese government for being a spy. Upon his release and asylum to the U.S., he wrote his story. I read this book about 3 years ago, back when I was slightly ignorant about Darfur. It wasn’t an easy read – purely because of the content - but Daoud Hari makes his point in a simple but effective manner. The Translator was deeply personal and moving, and despite the tragedy of the conflict, it still managed to have subtle tones of humour, joy, friendship, and hope.